With biting wit and charm, I Love You Subject to the Following Terms and Conditions is hilariously relatable, for the millennial set. 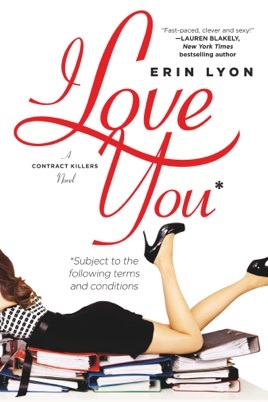 Lyon's clunky debut, the first in an anticipated series, takes place in an alternate contemporary California where the word marriage is replaced with contract, and the religious aspects are swapped for legal ones. People enter seven-year legal contracts that can renew, expire, or be breached. Kate Shaw is a 34-year-old recent law grad without a job. She's in a loving contracted relationship, but her partner, Jonathan, decides not to renew it, because he never saw himself as a signed man for the rest of his life. After Kate grudgingly accepts a job at her uncle's contract law firm, she befriends Adam Lucas, a man who's notorious for going after contracted women. Within a week of separation, Jonathan wants Kate back. Kate must choose whether to go back to him or venture forward. Though she claims to love Jonathan and has only a crush on Adam, she never tries to repair the earlier relationship. Lyon tries to create a self-aware and socially perceptive protagonist, but Kate instead becomes presumptive in her intuitions. She assumes Adam's a "broken toy" throughout the novel despite the lack of any communication divulging Adam's backstory. A failed love triangle and a tiring protagonist undermine a noteworthy central idea.